India or Bharat has an illustrious history to boast of, from being the home to one of the most ancient civilisations of the world to being a confluence of diverse religions, cultures and topographies. With the eventful reigns of many empires across the different regions of India, history has gifted the country with many monuments to boast of. Each of them have a story to tell of the bygone eras, and each reflect the true essence of India, in their own special way. So it comes as no surprise that international bodies such as the UNESCO have identified 32 sites of educational, scientific and cultural importance in India. Known as World Heritage Sites, these sites represent creative genius, outstanding examples of technology and a marked example of a specific time in history. Here is a visual guide of the 32 UNESCO World Heritage Sites in India. These are both man-made monuments and natural sites in India that you must visit! Why: It is the home to the world's largest population of the Single-Horned-Rhinocerous and is also a protected tiger reserve. Besides this, the park also hosts a variety of other mammals, birds and reptiles. Why: Manas Nationl Park has the unique recognition as a park that hosts endangered animals not found anywhere else in the world such as the Assam Roofed Turtle, Hispid Hare, Golden Languar and Pygmy Hog. It is also a World Heritage Site in danger from poaching and terrorist activities. Why: Named a World Heritage Site for its cultural and religious significance, Mahabodhi Temple is where Siddhartha Gautama Buddha is known to have attained enlightenment. The oldest structures of the Temple date back to the 5th century. Why: Among the first tomb structures to showcase innovative architecture with elevated structures, gardens, well-managed water channels, pavilions, bath and attractive dome at a height of 42.5 mt. Why: Standing tall at 238 ft, this red standstone structure is a sterling example of fine Islamic architecture. It was built from materials plundered on various conquests from other kingdoms. Why: Built by Shahjahan in the 17th century, the fort displays an interesting mix of architectural styles ranging across Persian, Timuri and Indian styles. Why: Built by the Portuguese between the 16th and 18th century, the Churches and Convents are fine examples of architecture and culture. Why: This stunning expanse of landscape is considered to hold many unexcavated archaeological finds. The place has many monuments, temples, pre-historic sites, forts and palaces. Why: Once the capital of the powerful Vijayanagara Empire, Hampi now is a silent testimony to the grandeur of the past. Exqusitely built temples and monuments, many of them in ruins give this place an unique charm. Why: An outstanding place where nine Hindu temples and a Jain temple can be found along with other interesting structures that sport a mixture of architectural styles. 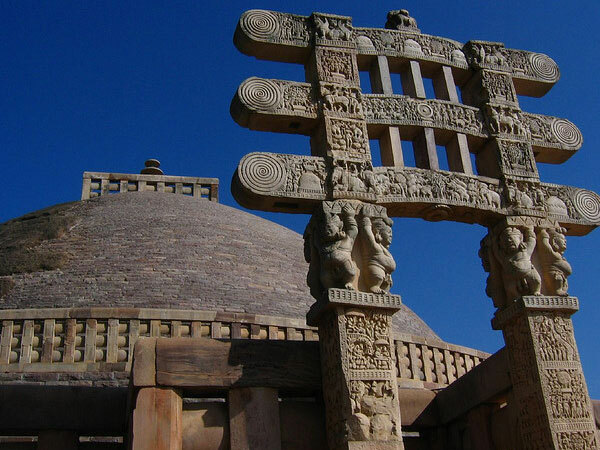 Why: Built in the Mauryan Empire during the rule of Emperor Ashoka, the main stupa dates back to 1st century BC and has been given the status of UNESCO World Heritage Site for its contribution to culture. Why: Natural sandstone rock formations that sport detailed paintings that date back to Mesolithic period. The Rock Shelters consists of a total of 400 painted structures. Why: Outstanding architecture with intricate artistic detailing is seen across the many temples and monuments of Khajuraho that is a symbol of both Hindu and Jain religions. A site of immense cultural importance. Why: The 31 rock-cut Buddhist caves have early structures dating back to the 2nd century and are known to display the oldest wall frescos in the country. The rich colours and detailing of these disintegrating wall murals are similar to the Sigiriya painting style of Sri Lanka. Why: 34 monastries and temples built into the rock formations of a cliff, they are a great example of architectural and sculptural finesse of early India. Why: Located 10 km from Mumbai, this place consists of five Hindu and two Buddhist caves. The exquisite artwork earned it a name among UNESCO World Heritage Sites of India. Why: Functioning as the railway headquaters, this busy railway station in Mumbai was built during the British rule and intially named 'Victoria Terminus' in honor of the Queen. It sports the Gothic style of architecture and was designed by a French architect. In the year 1996, the name of this terminus was changed to the popular Maratha King's name Chhatrapati Shivaji. Why: This 13th century temple also referred to as the 'Black Pagoda' displays an expansive structure of the Sun God's Chariot sporting 24 wheels and pulled by 6 horses and is of cultural importance. Why: Spanning across 6,880 acres of land, this National Park is popular for the 364 species of winter birds that come here from various regions of the world. Why: Jantar Mantar is an interesting collection of astrology inspired architecture. Early obervatories and atronomical instruments are located here. Why: Consisting of the three great temples built during the Chola Period namely the Brihadisvara Temple in Cholapuram, Airavatesvara Temple and the Brihadisvara Temple in Thanjavur. The Chola brilliance in architecture, sculpture, bronze casting and painting has been recognised as a UNESCO World Heritage Site in India. Why: Built by the Pallava kings, these animated sculptures and temples were carved out of rocks on the Coromandel coast. It is a site of immense cultural significance. Why: Built from red sandstone, this vibrant fort is located on the banks of river Yamuna and owes its many impressive structures to different reigns. It is considered a key cultural site from the Mughal empire. Why: The early capital city of the Mughal empire, the Fatehpur Sikri is a complex of monuments, temples and mosques, all built in the Mughal style of architecture. Why: Listed among the seven wonders of the world and considered one of the most prominent symbols of India, Taj Mahal built by Shahjahan in memory of his wife is a lasting symbol of love and beauty. The vast property consisting of various other monuments and gardens showcases a mix of Persian, Mughal and Indian architecture. Why: The five railway lines built in the mountains by the British and still operate under the Indian Railways are conferred the World Heritage Title. They are in Darjeeling, Shimla, Nilgiri, Kangra Valley and Matheran railway lines. Why: The Valley of Flowers that is famous for its meadows of beautiful alpine flowers and also the home to many species of animals. The Valley and the rugged mountains contrast each other and mark an important area of transition between mountain ranges of Zanskar and Great Himalaya. Why: Known to be the largest mangrove forest in the world, it is also a Tiger Reserve. Home to the largest population of the endangered Bengal Tigers. Why: The range of mountains that traverse the wester side of India consists of many sanctuaries, national parks and reserve forests. It is considered to be the cluster of India's most prominent bio-diverse hotspots. Why: Representing the Rajput style of architecture that is also an interesting example of military-hill architecture, the many forts across the Aravallis Mountains is a key contributor to educational, strategic and cultural learning. Why: Constructed as per the inverted temple structure, this stepwell comissioned by the Queen Udyamati of the Solanki dynasty is considered to be the largest and most intricate of the stepwells in India. A seven storey structure with over 1500 sculptures of various Hindu gods, apsaras (dancing maidens), kings and sadhus, this place is one of the most recent additions to the UNESCO World Heritage sites in India. Why: A vital hotspot of bio-diversity, this region has towering alpine peaks, meadows and forests. The orgin of many rivers and streams are also located here, making this a very significant site in regard to conservation.